From some of the folks who brought us This Is Us and Crazy Stupid Love, this a film told in five distinct chapters. So as you can expect it's full of a wide range of emotions, drama, tragedy, highs and lows, and as the film summarizes, life itself. It's raw, at times very ugly, and it doesn't hold back in any way. I wouldn't call it a chick flick but emotions are very messy and the weight of the storylines in this film might possibly be for some. 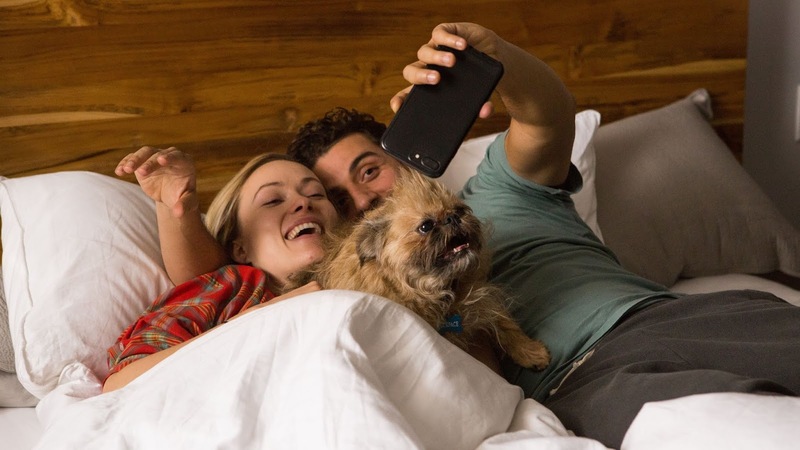 The first is about a young couple's intense budding relationship from college (Olivia Wilde and Oscar Issac) through their eventual life together as a married couple, expecting their first child. The second is about a young child growing up under the care and watchful eye of her loving widower grandfather (Mandy Patinkin) and how her life begins to spin out of control as a young woman. The third is about a wealthy Spaniard (Antonio Banderas) who runs an olive orchard and how life evolves for him, his prized employee, and the employee's young family over time. The fourth is about a foreign student and his experiences at university at NYU, and the 5th is about a novelist. They film begins interestingly enough narrated by Samuel L Jackson, as if he were the director on a movie set. In the beginning we feel that the film is going to be full of humor and although the script has its witty moments, this film becomes very dark and quite depressing. As a result, it takes us awhile to orient ourselves the how the stories in the film are going to unfold. Annette Bening plays a psychiatrist who is counseling a young man as mandated bye the terms of his release from a mental health hospital. And the stories unfold from there. There are not the usual scene and prop clues to give us a solid feel for what time periods we are watching but we eventually learn that the stories are all connected in some way similar to the screenplays for Crash or Babel. What we take away is that all people experience pain, tragedy, illness, darkness and through the passage of time it is possible to emerge from those clouds and it better more positive place. There are parts of the story line that weigh on the observer like a heavy weight on the brain or the heart and one keeps hoping that as the dots are connected that the end message is redeeming and positive. The full range of emotions and states is on display, in very intense colors and patterns, including intense love, loss, abuse, sacrifice, grief and mourning, misdirection, mental illness, connection and disconnection, the importance of family and twists of fate and serendipity. One just must keep going, no matter what one indoors or what life throws in your path because in the midst of darkness, the seeds might be being sown for someone else around the corner or down the road. There's a fair amount of buzz that this is the worst movie of the year so far, which the writer/director defends as being because most reviewers are men and men can't handle heavy emotion, but I'm more inclined to allow each individual to make up their own mind for everyone is going to take something different away from it. The film had my attention the entire time, as I tried to put the pieces of the puzzle together, so that level of challenge was much appreciated. It's a fine line between feeling emotionally manipulated, cheaply and on purpose and the sense that the chapters were well thought-out and crafted as they were put down on paper. I think each viewer will have their own opinion about it with reference to "Life Itself" because every individual will be bringing their past experiences, thoughts, and attitudes with them into the theater, so that the potential will be for everyone to take something different away from the exact same film. This is just not going to be the best first date film or a fun night out for a bunch of high schoolers. It's heavy, heady stuff.